When Jasmin and I arrived home the other night, we switched on CNN. It was 12:35 a.m. We had just arrived from a late family dinner after watching the terrific show, ONE: A CONCERT FOR A BETTER WORLD, of our school, Bright Academy. It was TW1. Yes, the only athlete to have climbed the $1,000,000,000 mark in earnings; the most gifted sportsman in all of golf–and possibly, in all of sports. Watching the replay of his press conference minutes after it was shown live by CNN, I sat down in my bedroom couch. Jasmin wouldn’t glance. She detested Tiger. “He’s a fake,” she said. Tiger spoke. What an awkward moment. For the Tiger we’ve grown accustomed to seeing was Tiger in full command: pumping his first after sinking that 22-foot birdie putt or strolling confidently on Augusta National’s green grass. Always, Tiger appears self-assured, decisive, poised. Not the other night. Tiger looked scared. Gloomy. Unsure. His face was anguished. It was obvious, based on the body language and his stammering… to say… the right…. words… out… loud… that this… was… all rehearsed for that maximum, I’m-so-sorry effect. “It looks so scripted,” said Jasmin. Mixed results. As for me, I’m glad Tiger has spoken. To recall, that mysterious tree-smashing car accident happened in Nov. 27. Now, finally, he’s emerged from the woods. I’d have preferred, though, that he spoke sooner, maybe a week after? But Tiger is Tiger. He’s a control freak. In the same way that he controls his golf swing and the outcome of tournaments (mostly, to his favor), he wanted to control this bizarre situation. But, from what we’ve witnessed the past 2 1/2 months, he couldn’t. This story has transformed into a jackpot for the tabloids. 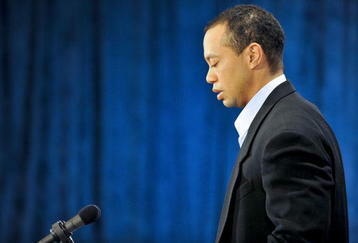 Or maybe Tiger could have opted for one-on-one with Larry King or Oprah. (Absolutely not in The View, for he’d have been roasted by Barbara Walters and Whoopi Goldberg!) With either Larry King or Oprah, he’d have appeared more human and personable, less stiff and less scripted. For now, he’ll have to do more. More weeks of therapy. More time with Elin. More time away from the public and our tsismis-filled minds. And, when he returns, he’ll have to do more: win more major trophies to remind us of his greatness–and to catch up on his pal Roger Federer who now has 16 Grand Slam titles versus his 14. Go on, be a Tiger? Uh-uh, says Jasmin.